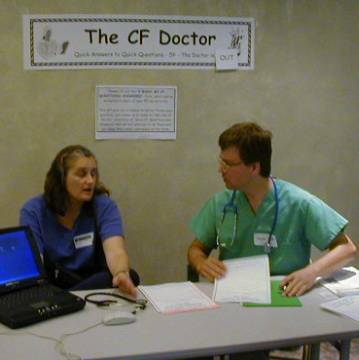 The CF Doctor was at the CF 2001 Odyssey conference answering attendees’ ColdFusion programming questions. We look at some popular questions and answers here. A lot of users want to know how they can get to files outside of the physical server that CF Server is located on. This includes ODBC connections to file based databases, such as Access97. This is a common problem that first time users of CF run into on NT. 1) Open the Services option from the control panel. 3) Change the “Log On As” option from “system” to a real user, for example “Administrator” or make a new user just for this ColdFusion service. Whatever permissions this user has on the network, Coldfusion will then have. Verity Search has ceased functioning on the server and any new collections can not be created. This is a common problem when upgrading from CF Server 3.5 to 4.01. The real solution at this time is to upgrade to 4.5, with the 4.5.1 patch. Then delete the indexes and recreate. How can we enhance, and speed up dynamic web pages generated by ColdFusion. First, determine if the problem is with ColdFusion or with your HTML. Turn on debugging in the CF admin, and make sure you have “Show Processing Time” (with Detail View in 4.5) turned on. Then check the time CF takes to generate the page. If this is a large number, then you need to spend some time optimizing your CF code. If the CF number is low, but the page still takes a long time to display on the browser, then the problem is probably with your HTML. Break up long tables! Page your data display (Page 1 of 10 for example. ), or close your tables every 100 records (or so) and start a new table. If you must display long tables, take out tabs and white spaces before all <tr> and <td> tags. You might loose your nicely indented code, but it really does help! Avoid deeply nested tables (say, more than 5 or 6 tables deep). If you have the option, use IE. IE 4 handles nested tables (and long, complicated tables in general) much better than Netscape 4. Put sections that are CF code intensive between <CFSETTING enablecfoutputonly=”YES”> and <CFSETTING enablecfoutputonly=”NO”> tags to get rid of unwanted white space that takes time for your browser to render. Use CF template cache! Set your template cache size in the CF admin to a larger number. 3. Make the database do more of the work! Most slow web sites are due to inefficient use of the database behind the web site, so learn more sophisticated SQL, and use stored procedures, grouping and calculated fields in summary queries, instead of having CF do the calculations in a loop. The database will ALWAYS be able to calculate data faster that ColdFusion. 4. See the question/answer below on dynamically generating fast, static HTML in place of CF pages. I want to generate a series of static HTML files dynamically, based on some CF templates. How can I have CFFILE read a template, insert CF variables in the appropriate places, and then save the output results to a static HTML file? A lot of people realize how fast HTML files are without CF! However, you can use CF to dynamically “write” static HTML files themselves! 1. Make a template with CF variables that would display your fields from your publication table. 2. Run a query to get your publication table. Let's say there is an ID field for each pub called "Book_ID"
4. Loop over the query, writing a file for each record in the DB. 5. You might want to first delete all files in the directory you are writing to, or check for existing files before writing, so you don’t get errors, or delete files unexpectedly. 6. You could run this code on a schedule, and “re-generate” your web site once a week or once a day, keeping it up to date and very, very fast. Use the <CFSCHEDULE> or the NT scheduler (AT command). How can I encrypt and save passwords in my SQL Server table? Use the Encrypt() function that comes with CF, or download one of the many encryption tags from the Developer’s Exchange section of the Allaire web site. By the way, you don’t have to decrypt the password from the DB to compare it! One the encrypted password is saved, and the user is registered, the next time the user logs on, simply encrypt the value from the form and compare it to the encrypted string from the database. If you don’t provide a decryption routine, then this allows you to have “one way” encryption where the user’s password cannot be discovered, even by the system administrator. How can I attach multiple documents in one email? Body of email text goes here…. Using CF 4.5.1, if I restrict the CFREGISTRY tag (in the CF Administrator), then I can’t use the ColdFusion Scheduler. Is running the NT scheduler (AT) the only option? The CF Doctor is Douglas Smith who is the web/database architect for TeraTech. Michael Smith is president of TeraTech http://www.teratech.com/ a 12-year-old Rockville, Maryland based consulting company that specializes in ColdFusion, Database and Visual Basic development. TeraTech runs the MDCFUG and recently organized the two-day, Washington, DC-based CF2001 conference that attracted more than 150 participants. You can reach Michael at Michael@teratech.com or 301-881-1440.